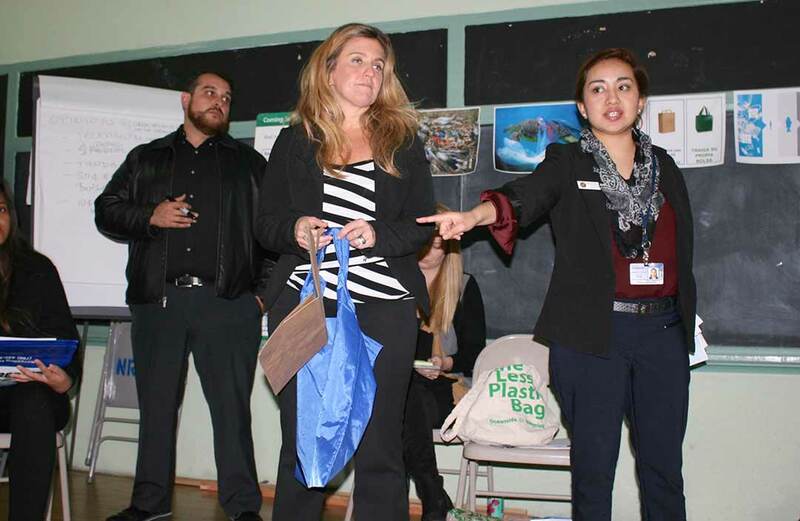 OCEANSIDE — A community workshop at the Crown Heights Community Resource Center on Tuesday uncovered more problems than markets distributing plastic bags. Several residents said their apartment complexes do not provide a recycle bin. This leaves residents with the burden of storing all recyclables and hauling them to a recycling facility. Those without a recycle bin on site said items quickly pile up. Colleen Foster, city solid waste and recycling management analyst, told residents the city would like to work with them, and directed those with concerns to call and provide more information. The city regularly works with businesses to reduce waste and increase recycling upon request. In most cases the cost is less to have recycle and trash bins, rather than trash bins alone. The workshop was held to share a proposed city single-use plastic bag ban, which would stop grocery store distribution of throwaway plastic bags. Speakers from the city’s Zero Waste Team, H2O Trash Patrol waterway clean up, and Surfrider Foundation environmental group shared the dangers of plastic getting into waterways and into the food chain. Gumaro Escarcega, MainStreet Oceanside program manager, and others at the meeting said it was an eye opener to learn that fish consume bits of plastic and pass on toxins to people. Resident Rosa Penaflor said she found it interesting to learn how plastic breaks down, and vowed to stop using plastic bags. Residents voiced support for a ban, and agreed that a charge of ten cents a bag would motivate them to bring their own reusable bags. Food truck drivers that sell canned goods, boxed foods, fruits and vegetables in the neighborhood were not able to attend the meeting which was held during their peak business hours. A food truck driver open for sales on Division Street following the meeting said she has considered not handing out plastic bags, but when customers who purchase multiple items are asked if they would like a plastic bag, they always reply yes. Basically it is a matter of customer demand. The Zero Waste Team is meeting with 45 community groups to collect feedback on the proposed bag ban. Foster said so far feedback from businesses has asked for a phased-in approach, and residents have supported the habit change. Outreach efforts began in January and will continue through Feb. 6. Findings will be shared with the city’s Utilities Commission Feb. 16, and with the City Council March 2.